High-quality floor pumps, mini pumps and frame pumps, precise suspension pumps and the original product, the SKS-RENNKOMPRESSOR define the bicycle air pump range. 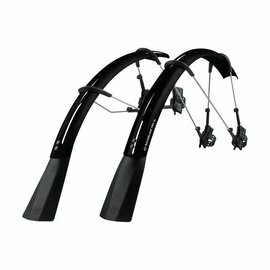 Even in the area of spray protection (fenders), new developments drive the victories that SKS has attained in the bicycle accessories segment. Compact bicycle tools, chain guards, bottles, bottle holders and bags have also been integrated into the SKS range of products in order to provide for even more comfort and safety while cycling. The quality stamp MADE IN GERMANY is reflected in the high standards for quality, functionality and design. This is because SKS products are developed at the in-house Research and Development departments with our years of experience and creativity and are then rigorously tested. The many awards such as the RED DOT and the EUROBIKE AWARD, the title »Führender Anbieter für Fahrradzubehör« (Leading supplier of bicycle accessories) and the many, excellent test ratings in renowned trade magazines speak for themselves. The global market has created an environment in which it is a challenge (and a passion) for traditional companies to continue to competitively manufacture in Germany, and to provide employment to over 300 employees in the region. In addition, up to 30 young people are continuously in training at SKS for a future in business. SKS has been awarded the seal of approval with the title of »Ausgezeichneter Ausbildungsbetrieb« (Excellent Training Company). Youth and amateur cycling sports clubs and regional cycling events are regularly supported by SKS. The annual Mountainbike Festival, »Mega-Sports«, takes place in Sundern where participants from all over the world attempt to conquer Sauerland’s heights in this challenging SKS Bicycle Marathon. Professional bicycle equipment is proudly produced in Sundern and displays the distinctive logo in the characteristic SKS orange. A color that represents strength, action and progress and blazes like the fire which has burned tirelessly in the heart of the company for over 90 years.